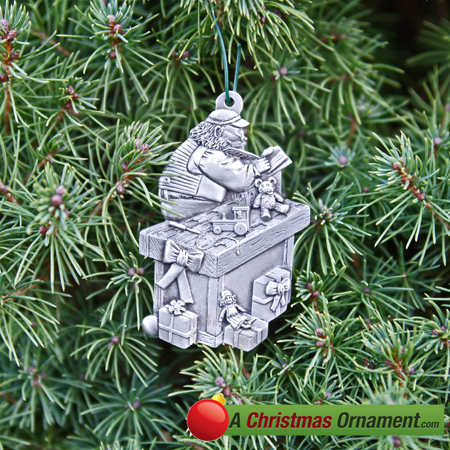 Christmas Ornaments Made in USA - Pewter Santa Clause Workshop Ornament - A Christmas Ornament Co. This time of year good ol' St. Knick is in preparation for the Christmas Season. Santa Clause puts on his glasses and checks his list twice to see who has been naughty or nice. He makes sure all the good children receive the correct gifts on Christmas Day. Teddy Bears, toy trucks, and dolls are just a few of the millions of toys Santa puts together in his workshop. You must be a good boy or girl because Santa Clause is always watching. We all know what you receive if your name ends up on the infamous "Naughty List". This ornament measures 2.5"x2.75" and is Made in the U.S.A.